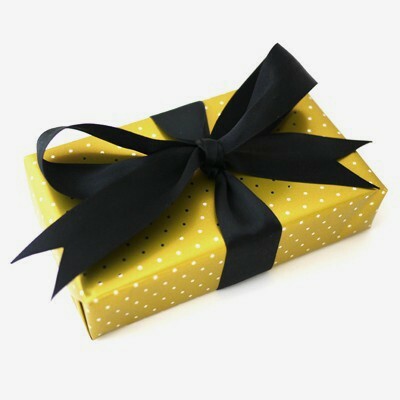 Add a special touch to your gift with gold gift wrap, tied with luxurious double faced black satin ribbon. Please list which items should be wrapped. Multiple items can also be wrapped together. Please include instructions in the text field provided below. If only one order of gift wrap is purchased, items will be wrapped together. Jewelry items are held in a black paper box with a magnetic closure and finished with a lovely imprint of a gemstone, as seen in the second image.